This sample is a preview you can print and keep for yourself. 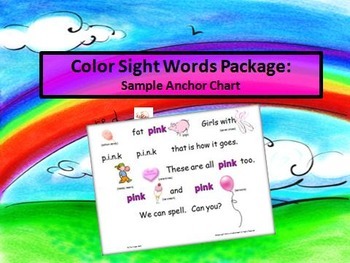 It is an anchor chart for the color pink. I adapted the lyrics from a song that I discovered from searching for songs. The lyrics are not exactly the same, because I wanted something a little easier for students to recall and to sing within the tune. My larger color sight words package includes anchor charts and song lyrics for the colors red, orange, yellow, green, blue, black, purple, white, brown, and pink. I include write-it, draw it/ cut & paste it/ and color it charts. I also include crayon graphics that students can color to help them recall the colors and spellings.